GenerEOS is committed to educate industry and academic institutions about the benefit of blockchain and in particular how to build distributed applications on top of the EOSIO stack. We have now expanded our course offerings from basic EOSIO stack and smart contract development to now also include full end-to-end development using the Demux framework. 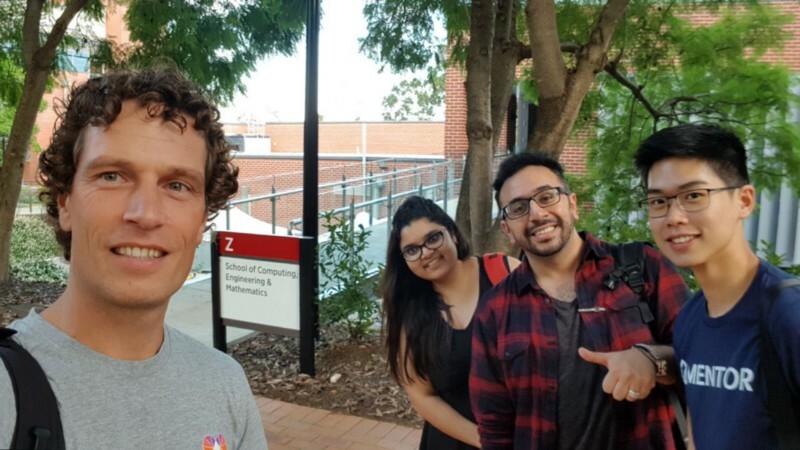 In February Ralf from GenerEOS led a half-day introduction and hands on workshop for Phd students at the Centre for Smart Modern Construction (c4SMC), Western Sydney University where they learned the concepts behind EOSIO and how to implement, deploy and test a basic smart contract. Last week we returned for a full day hands-on development workshop with the aim to build a complete DApp on EOSIO from the ground up. This time, Ralf was joined by our new team member Ignatius. We started this workshop by taking a deep dive into the communication model behind EOSIO contracts covering the 2 basic communication models, action handlers and context identifications within both intra and inter-contract communications. We then explored the DApp codebase that we’ve built on top of the open source blogging application template from Block.One and how they could build their own script to launch and bootstrap an EOSIO local node on their machines using docker and bash scripts. We decided to adopt a flipped classroom based approach, we started by stepping through the main components of a smart contract by first engaging students to offer their own ideas in a whiteboard design session, how they would design and validate such a contract with some best practices for their own project requirements. We then guided them on how they could bootstrap the compilation and the deployment of such a contract. The main course was a dive into the demux architecture and how they would choose, design or build their own readers and handlers among many variants to reliably filter and source events. This was followed with a demonstration of a react frontend that shows full-circle how an action request is sent through to the blockchain, is read by demux’s action reader, passed by the action watcher and processed by the action handler before finally showing real-time socket updates on the frontend. It was great to see how keen and engaged everyone was and to listen to the ideas they came up with on how they plan to use what they have learned from this workshop in their own research projects. We look forward to seeing the progress they have made over the coming weeks and what amazing research projects they will be building on top of EOSIO.